Sometimes a photograph seems to focus on something incidental but actually captures the deep structure of a situation. Nice back, isn’t it? And the tattoos look pretty sharp, although it’s hard to appreciate the detail from here. 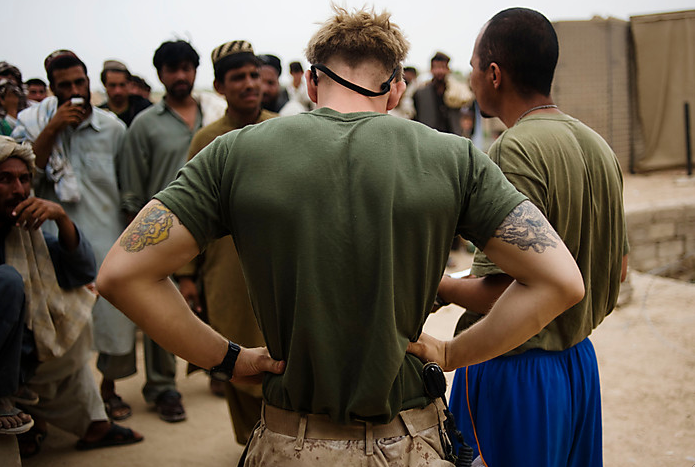 And that would seem to be about it: an anonymous Marine is physically fit and tattooed. Interesting, but hardly news and surely not the key to ending the war in Afghanistan. The photographer’s skill begins to emerge when one reads the caption for the photograph in The Washington Post: “A Marine tries to talk to residents of southern Marja, who gathered in front of a small outpost to voice complaints to the troops stationed there.” I assume that the caption is referring to the guy in the blue trunks, as he’s the one doing the talking. But perhaps he’s an interpreter instead of a Marine. The text refers to one Marine, after all. If so, the Marine “talking” is in fact waiting, lost in translation, you might say. Things are getting complex, aren’t they? The visual composition emphatically features the Marine in the center of the photograph, while the text seems to refer to the other foregrounded figure and to the villagers while leaving someone unmentioned. And so the photo may not be showing communication at all. The more I look at the picture, the more it seems like something out of an extreme sports event. The dude in the center looks like he could be a surfer, mountain biker, base jumper, or some other high-risk, outside the box athlete. The rest of the scene can lock into that theme. Dude is waiting out the preliminaries, maybe even getting into his zone, while his agent or some media flack briefs the locals about their part in the event. Dude is cool, focused, totally able to get it done; just don’t ask him to talk and you’ll be fine. The intermediary carries his share of derivative cool–check out those shorts–but he definitely is working in a more familiar mode. And the villagers? Oh, yeah, the extras in the scene: distant, fuzzy, a vaguely illegible mini-mob there to be pacified, they are only today’s background while the show goes around the globe. Of course, this analogy is unfair to the actual people in the photograph, but photojournalism is not about its literal referent. Young men in arms are going to dig getting big, sporting tattoos, wearing sunglasses, listening to metal, and otherwise acting their age, and the dude actually could be a captain listening astutely on behalf of effective negotiations, and the villagers are in fact being pro-active by voicing complaints. What the photograph captures, however, goes well beyond those facts. If the central figure is the one “talking,” then it is through an interpreter with people whose interests are barely in the picture. If he is not the one talking, then talk is being backed up by force that waits to be unleashed with little regard for whatever was being said. And whatever the story, one can’t help but think that a basic tendency in American culture is being revealed. Whitman celebrated democratic athleticism, but we are further down the line now. Vernacular grace has been harnessed for powerfully focused, high-adrenaline competition. Whatever the complexity of the world, Americans are turning war into an extreme sport. Photograph by Andrea Bruce/Washington Post. You might add bodybuilding to the list of extreme sports… a sport in which “getting big” is not the means to an end but an end in itself. Moreover, it’s a popular sport for soldiers, and one that’s leading to some issues with steroids and the like. Before read the post, I looked at the photo and thought it was going to be an entry about how unhealthy he looks. I thought those were bones sticking out of his back, and his waist seems unnaturally small. I thought this was going to be about soldiers suffering in the heat from dehydration or local bacteria or something like that. I’m really stunned to find out what this photo is supposed to be actually depicting. Yeah, my first thought when I saw the photo was that he was emaciated. I thought the “Nice back” opener was leading to a sarcastic analysis of how our soldier are faring over there. I did consider whether he was undernourished as he is so thin-waisted. I also spend time in the gym, however, and the rest of him looks like what you can see around the weight room: he’s lean, but with good muscle definition. Add the haircut, strap for the glasses, and the rest and he looks like he’s outfitted for some kind of intense workout.